Jack Hirsch co-captained (with Walt Hazzard) UCLA's first NCAA Championship team in 1964. That season, the UCLA senior led the Bruins in field goal percentage (.528), and was third in team scoring, rebounding, and free throw percentage. He averaged 13 points in the Bruins’ four NCAA playoff games, scoring 13 points against Duke in the title match-up. The 1964 Bruins were undefeated (30-0), and Hirsch was named first team All-Pac-10, as well as All-America honorable mention. A year earlier, his first at UCLA, Hirsch started 27 of 29 games for the Bruins, was selected All-AAWU second team, and won the University's Irv Pohlmeyer Memorial Award as the team's outstanding rookie. Brooklyn-born Hirsch was a standout prep player at Van Nuys High School. In 1959, he was named Los Angeles City Co-Player of the Year. 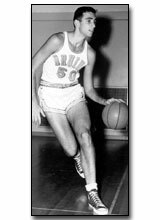 Two years later, at Los Angeles Valley College, he earned 1961 All-Metropolitian Conference first team honors, setting a school record with his 23.6 scoring average. Jack Hirsch turned to coaching after his competitive days at UCLA. He teamed for many years with Bruin teammate Walt Hazzard--first at Compton College, then Chapman College, and finally at UCLA.